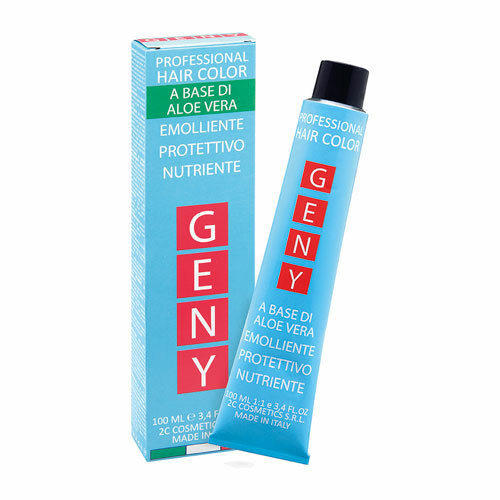 GENY is a permanent oxidation dye conveyed on cream. Rich in natural elements making their properties and interacting with each other to give excellent results. Aloe maintains the perfect health of the scalp and give moisturizing effect, creating a barrier that prevents the skin from losing water. This occurs in two ways: either the ability to transport nutrients through seven layers of skin is for ease of penetration due to polysaccharides. Olive oil is used to prevent the fall of hair helping to strengthen the hair bulb and feeding him deep. Finally, almond oil provides shine and strength to your hair brittle and fragile rigenerandoli mat , . shades: available in 38 nuances in the series: , ASH , NATURAL , AUBURN , GOLDEN tobacco , CHOCOLATE , ROSSI , IMAGINATION. -volume: 40 for 3 or 4 tones lighter.